While studying Education and Social Policy at Northwestern University, Diamond has had many opportunities to develop her interests. 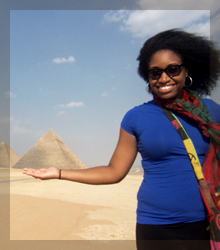 Whether she is doing research in African American Studies, working with Chicago Scholars, or studying abroad in Cairo, Egypt, she is always eager to gain new experiences. When asked about her accomplishments, Diamond has a long list of things to be proud of. She was recently awarded the G. Alfred Hess, Jr. Undergraduate Fellowship Fund Award. This prestigious grant was established in 2005 by Northwestern University to honor Alfred Hess and his major contributions to the School of Education and Social Policy. It supports and encourages students to develop their own research while engaging in interesting projects. Through this experience, she discovered her passion for academic research. One day she plans to pursue graduate level studies in African American Studies or Learning and Organizational Change. Regardless of her path, she knows it will involve achieving a Ph.D.